Bannon Predicts Three-Way WH Race In 2020 [VIDEO] - Joe.My.God. Former Trump White House strategist Steve Bannon is predicting that the 2020 presidential race could become a three-way contest. Bannon said on “Real Time with Bill Maher” on Friday night that the race could involve a three-way battle between President Trump, a left-leaning senator such as Kamala Harris (D-Calif.) and a centrist candidate such as former New York City Mayor Michael Bloomberg or Utah Senate candidate Mitt Romney (R). 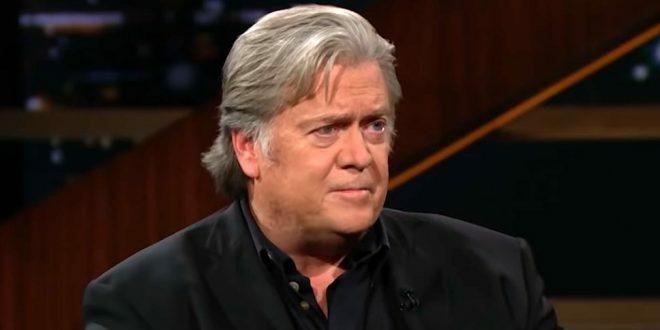 “You’re gonna have Trump on the right, a politician – maybe a Kamala Harris or somebody on the left – and I think you’ll have a Bloomberg or a Romney or somebody in the center,” Bannon said on the HBO show. “I think it will be a three-way race,” he added. “The guy who’s the outsider, who like blows through the regular politician because he looks different and he’s got balls,” Maher said. Bannon agreed. “If Bernie Sanders had an ounce of Avenatti’s fearlessness, he would have been the Democratic nominee and we would have had a much tougher time beating him,” Bannon told Maher.